Sunday 21st. 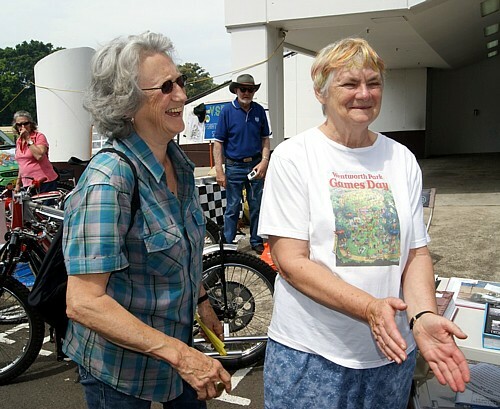 October 2012 was the date for the Wentworth Park Community Games Day. 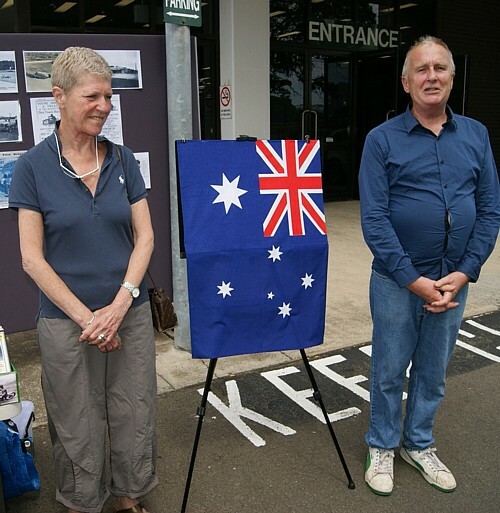 A feature for we Speedway people was a static display of Speedway bikes and cars and the unveiling of a remembrance plaque to commemorate the running of the sport of Speedway at the famous grounds. 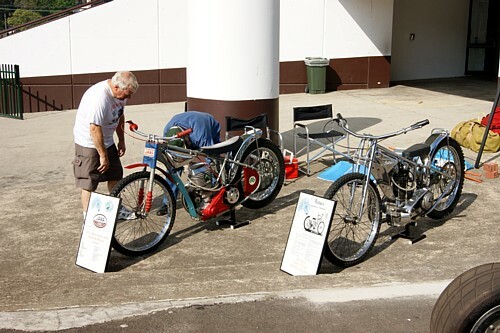 This was the second year the Sydney Vintage Speedway clubs had been invited to put on a display and take part in the day's activities. In 2011 I suggested to the Wentworth Park C.E.O. - Peter Mann - that I would like to see a plaque in place on the main gate pillars to commemorate the fact that the park had been a famous Speedway venue in the 1920s and 1930s. Peter was most co operative and he and the Wentworth Park Trust went ahead, after I submitted a design and text, and had the plaque cast at their expense......Thank you very much Peter and The WP trust. 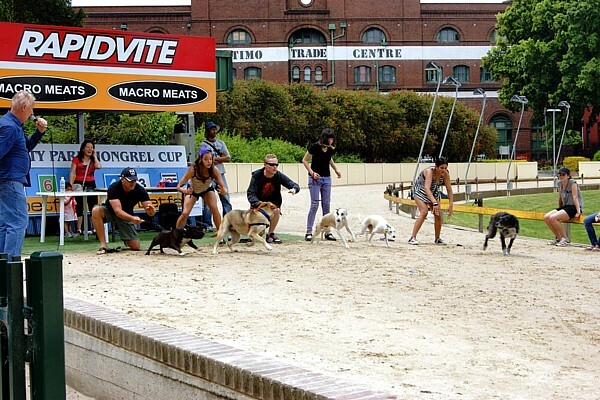 The big featue of the day is the running, on the dog track, of the Wentworth Park Mongrel Cup. 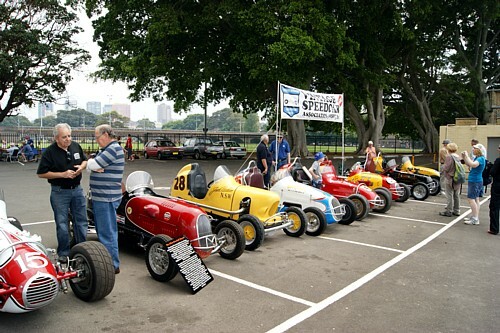 Early in the morning - the display of restored vintage Speedcars On the far left, two of the more well known Speedcar drivers of the 1960s. Gordon Benny (black shirt) and Sid Middlemass. 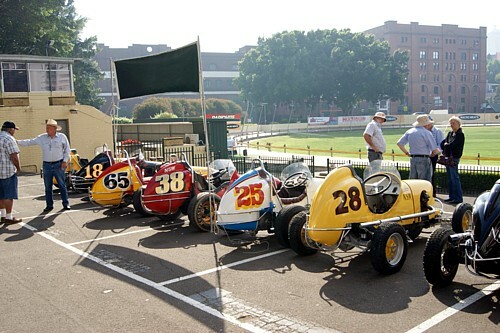 The famous yellow # 28 midget of Jack Brabham's ( now restored and owned by the Halliday family) in the line up for the second year. Sir Jack's first ever race car. Veteran Speedway Riders of Australia's Bill Powell sets his bikes up early in the day. Local parents and children with games on the green early in the morning. 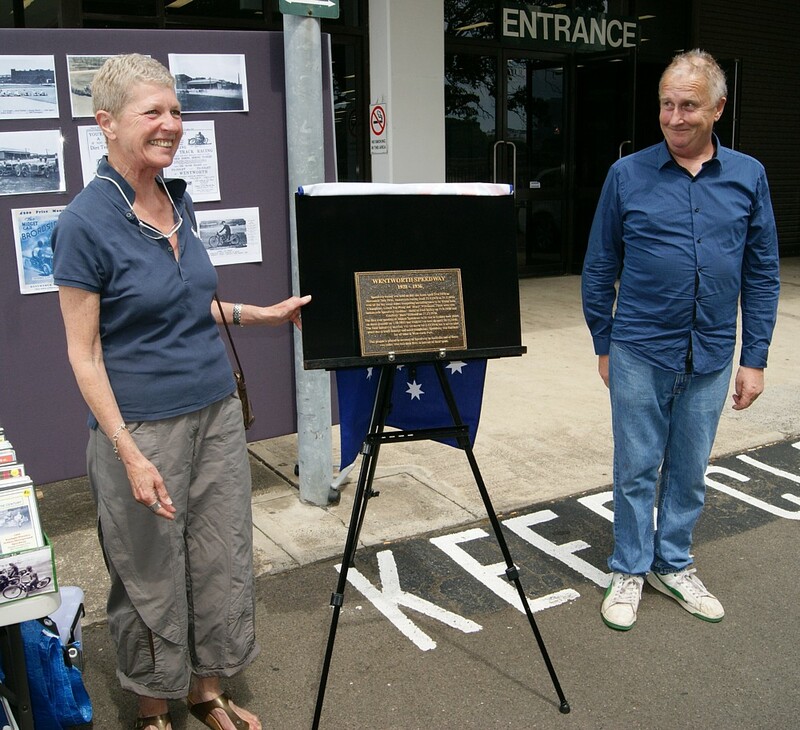 Ready for the plaque unveiling - (left)- Susan Cleary - Chair of the Wentworth Park Trust and (right) - Wentworth Park's C.E.O. Peter Mann. 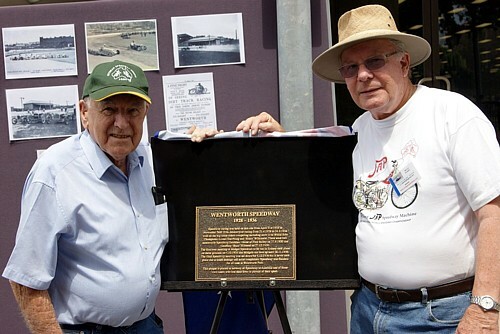 The plaque to commemorate Wentworth Speedway is unveiled. and (right) Mary Mortimer - Co Convener of the Community Games Day. 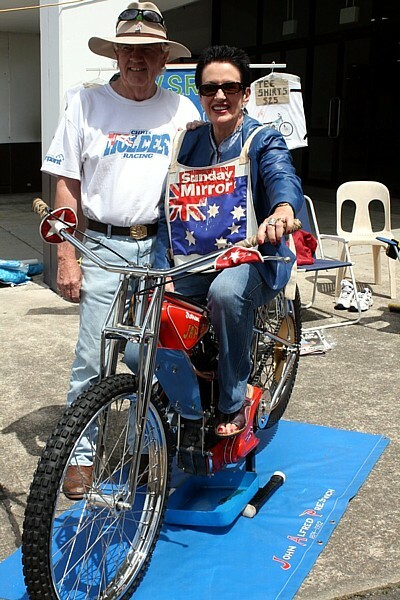 (Left) 1966 Australian Solo Speedway Champion - Chum Taylor - made the trip over from W.A. to attend the unveiling. Chum seen here with myself (Brian Darby ). I'm in the picture again ! - this time with Lord Mayor - Clover Moore. Peter Mann ( in foreground) says GO ! 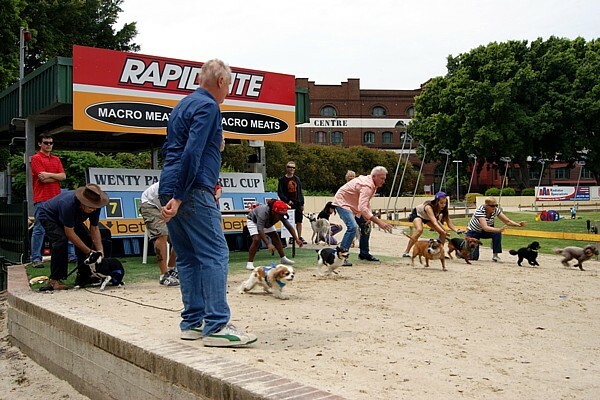 for the running of the 'Small Dogs Final ' of the Mongel Cup. These events are well worth the effort to attend the day's activities. They are out of the barriers for the 'Large Dogs' Final of the 2012 Wentworth Park Mongrel Cup. Thank you to all concerned - a great day out in Sydney.... Brian. on 27.12.1930. The first ever meeting of Midget Speedcars to be run in Sydney took place on these grounds on 5.10.1935 and Midgets ran here up until 28.11.1936. The final Speedway meeting was set down for 5.12.1936 but it never took place due to track damage and noise complaints. 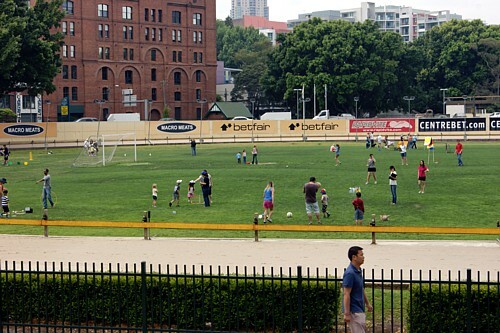 Speedway was finished for all time at Wentworth Park. 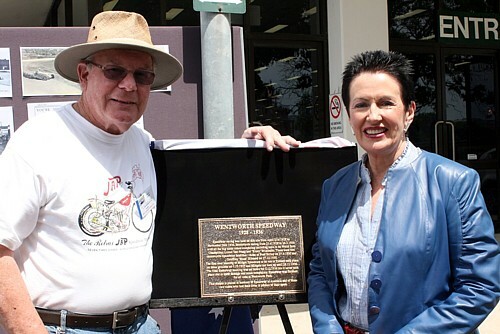 This plaque is placed in memory of Speedway in Australia and of those two riders who lost their lives in pursuit of their sport. The wording on the plaque.